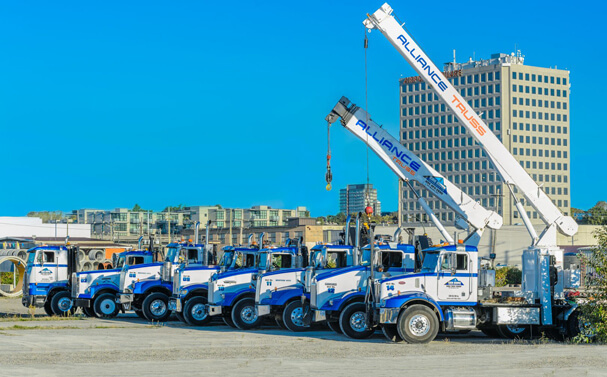 Founded in 1999, Can Ridge Industries Ltd. is a full service transportation and crane company. As a company, we provide transportation and industrial moving services for commercial and industrial products throughout British Columbia. Our logistics division also services all of Canada and United States. We are very proud of our team of dedicated employees that have helped to make our business successful. We are always working to satisfy our customers and earn the trust of potential new customers. With the support of our team, Can Ridge has expanded and now has a full service Logistics Division and Industrial Moving Division to better serve our customers. Our diverse range of equipment allows versatile transportation solutions with the ability to offload or place your products at site. Whether you are working in a tight urban space or a remote and rugged job site, we can orchestrate large capacity loads with ease. To learn more, please visit our Services Page. Can Ridge Industries Ltd is committed to a strong Health and Safety Program that protects its employees, contractors, customers , clients, the public and property from accidents and/or incidents occurring on our projects. We believe that all accidents are preventable. Our goal is ZERO accidents. Our team is dedicated to safe work practices, professionalism and integrity, who take pride in their work. All our operators are BCCSA Crane Safe certified, and undergo regular safety and equipment training. The Sales staff of Can Ridge Industries is committed to ensuring our customers’ success by delivering, with our dispatchers and supplier partners, the very best services and solutions. Our goal is to be a full service contractor to your needs. All of our equipment is fully inspected in accordance with WorkSafe BC and the Ministry of Transport regulations. All our operators are BCCSA CraneSafe Certified. Can Ridge Industries Ltd is committed to a strong Health and Safety Program that protects its employees, contractors, customers, clients, the public and property from accidents and/or incidents occurring on our projects.